SCOTTSDALE, Ariz. (AP) One day in early November, Buster Posey felt his body respond more normally again as he rehabilitated from season-ending hip surgery. Working out his lower half with a 15-pound dumbbell in his left hand he leaned forward for a one-legged Russian Dead Lift. Posey felt the muscles in his right buttocks being used exactly the way they should. "This might be TMI," San Francisco's star catcher noted of perhaps providing too much information. "I could really feel the right side of my gluteus maximus engage - hadn't really felt that in a while. With all leg exercises I feel like things have been more symmetrical, so hopefully that's a good sign." San Francisco pitchers and catchers report this week and Posey plans to be a full participant from Day 1 of spring training Wednesday, pulling on the catcher's gear and squatting behind the plate for his part in pitchers' bullpens early in camp. He understands there likely will be some modifications to his workload at the beginning just to be safe. "I kind of had that feeling a little bit already just when I got to hit," he said of getting back in the batting cage. "I was like, `Man, this feels good, it feels good to be able to swing and feel like I'm swinging how I want to." 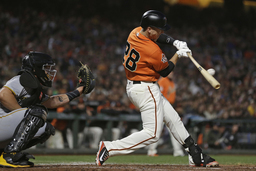 "I'm able to hit, throw, run and everything's feeling good," Posey said. "Having said that, it's still not the same as getting on the field for live BP or the games in spring training then obviously the season's a completely different animal. But I'm optimistic that it'll be fun." "I do know that we're going to be smart about it, careful about it, not just going into camp but even going into the season," Zaidi said. "If things go super, super well, even if he's ready to carry a full catching load to start the season I'm not sure that would be the prudent course for us so I think we're really going to err on the side of caution." "Again I think you have to be open to new thoughts and always be willing to adjust," Posey said. "I do know that there's been times late in seasons on years that I've felt really good where I've been like, `Man, I'm running low right now.' So it would be hard to say that if that type of strategy would pay dividends in late September or early October, but there's probably numbers that say they do I'm guessing." The 31-year-old Posey hopes with a healthy hip that his power numbers will improve as the 2010 NL Rookie of the Year and 2012 MVP begins his 10th - yes, that's right - full major league season. "I think regardless of hip injury, surgery or whatnot you're having to evolve and change how you're going about your day just as the years go by, so, yeah, I've changed the way I go about getting ready," he said. "I used to be able to just walk into a gym cold and jump on the squat rack. But those days are gone." "I'm sure it's going to be able to help out, the hip, being able to release it on the swing," Bochy said. "I've listened to our medical staff and they're confident this is really going to help Buster out as far as catching, throwing and on the hitting side, so I'm confident."